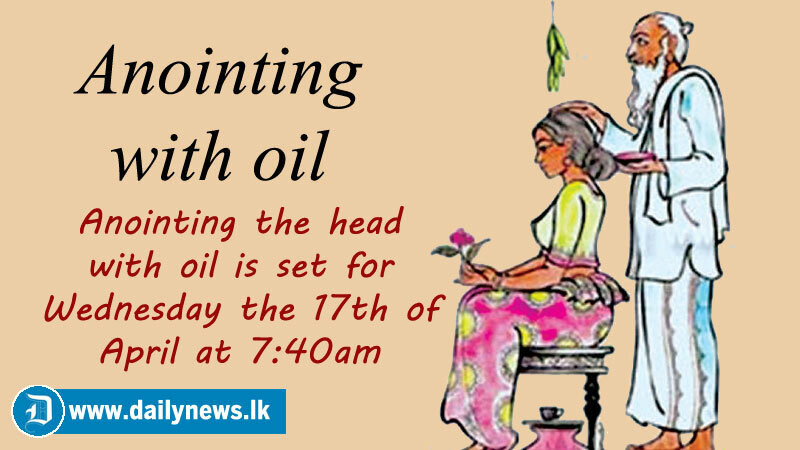 The National oil anointing ceremony will take place on April 17th Wednesday at 7.40 am at Sri Subodhirajarama Vihara premises, Bombuwala, Kalutara under the patronage of President Maithripala Sirisena and Prime Minister Ranil Wickramasinghe, Health Ministry spokesman said. According to the spokesman, Health, Nutrition and Indigenous Medicine Ministry and the Ayurvedic Department have organized the ceremony. Health, Nutrition and Indigenous Medicine Minister Dr. Rajitha Senaratne will also take part in the ceremony. Ven. Halwathure Assaji Thera will conduct the religious activities during the ceremony, he said. The National oil anointing ceremony is one of the key events of the Sinhala and Hindu New Year. It signifies the ensuring good health, he added.